The retina is the light-sensitive layer of tissue composed of nerves that lines the inside of the back of the eye, The retina sends visual messages through the optic nerve to the brain. This is how we see. A retinal detachment is an emergency situation in which an area or the entire retina pulls away from the back of the eye. If the retina detaches from the optic nerve, vision can be lost permanently. In some cases, the retina can be torn and this is referred to as a retinal tear. 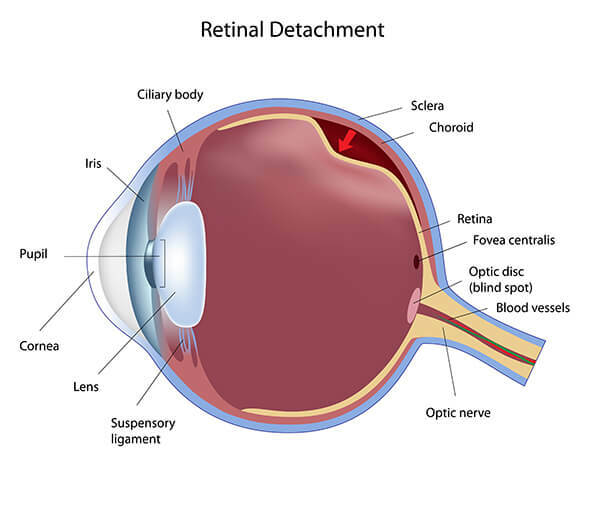 Retinal tears can lead to retinal detachments. Retinal tears or detachments can be caused by trauma, diabetes, or inflammatory disorders but are most often caused by a condition called posterior vitreous detachment. A Posterior Vitreous detachment is a very common condition that occurs at any age, but is more common after the age of 60. It is caused by natural changes in the vitreous gel, which takes up ⅔ of the space of the eye. The vitreous gel thins and moves more with age and can commonly separate from the retina. When this happens, you may see flashes of light (usually on a side of the eye), or an increase in floaters (pigmented or clear spots that obscure the vision temporarily and look like cobwebs or insects), shadows, or blurred vision. If, when the vitreous separates, it causes a tear or hole in the retina, that area could cause a retinal detachment. If you experience any of these symptoms, a dilated examination of your retina is required immediately. Treatment is available for torn or detached retinas. Cryopexy is a surgical procedure in which a cold ice probe is applied on the area to help form a scar so that the retina will hold to the underlying layer of the eye. Laser surgery is another method and it can seal the tear or hole in the retina. Pneumatic retinopexy is a surgical procedure that places a gas bubble in the eye and helps the retina float back into place. If you are experiencing any of the symptoms mentioned above, contact Magruder Eye Institute immediately to be seen by one of our doctors or schedule an appointment with one of our Retina Specialists.